Remember the lickable wallpaper decorated with a variety of fruit flavors in Willy Wonka and the Chocolate Factory? Pop and Lolli‘s coloring wallpaper is even better than that! We’re not sure many kids could resist the invitation to write on the walls in general, but they will all be clamoring to put their personal touch on this fabric wallpaper, patterned with a variety of charming male and female figures. We know what you’re thinking: What happens after my kid decorates the whole thing? First of all, that process will take a while since each roll is 52 inches wide and 8 feet tall! Secondly, this wallpaper features some great surprises — no professional installation is needed, no glue is required, and the entire roll is removable, re-usable, and non-toxic. You can cut the size and shape of the wallpaper to your needs and wants depending where and what you are decorating. The pattern is repeating, so creating seamless transitions from wall to wall won’t become a headache. Pop and Lolli’s wallpaper is a fun, interactive way for kids to express themselves in a dedicated space or room — although you may have to hide the coloring markers, crayons, and pens at bedtime to keep them from creating all night long. Reminding them that not all wallpaper is for coloring is probably a worthwhile recommendation too! Remember the lickable wallpaper decorated with a variety of fruit flavors in Willy Wonka and the Chocolate Factory? Pop and Lolli's coloring wallpaper�is even better than that! 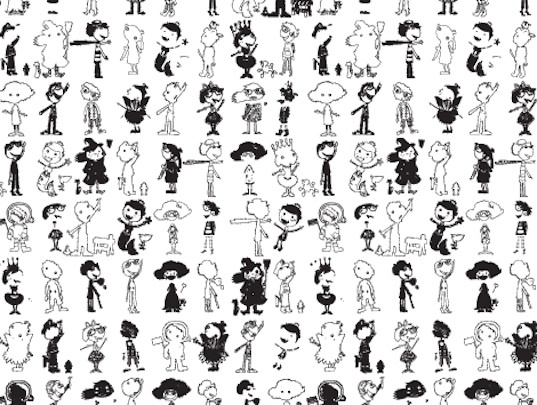 We're not sure many kids could resist the invitation to write on the walls in general, but they will all be clamoring to put their personal touch on this fabric wallpaper, patterned with a variety of charming male and female figures. We know what you're thinking: What happens after my kid decorates the whole thing? First of all, that process will take a while since each roll is 52 inches wide and 8 feet tall! Secondly, this�wallpaper features some great surprises -- no professional installation is needed, no glue is required, and the entire roll is removable, re-usable, and non-toxic. You can cut the size and shape of the wallpaper to your needs and wants depending where and what�you are decorating. The pattern is repeating, so creating seamless transitions from wall to wall won't become a headache. 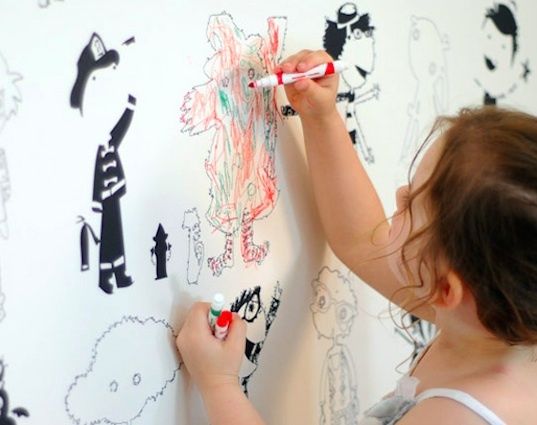 Pop and Lolli's wallpaper is a fun, interactive way for kids to express themselves in a dedicated space or room -- although you may have to hide the coloring markers, crayons, and pens at bedtime to keep them from creating all night long. Reminding them that not all wallpaper is for coloring is probably a worthwhile�recommendation too!